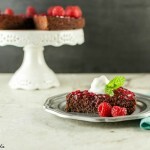 Chocolate fudge rasberry sauce cake low carb , keto, grain free and paleo. 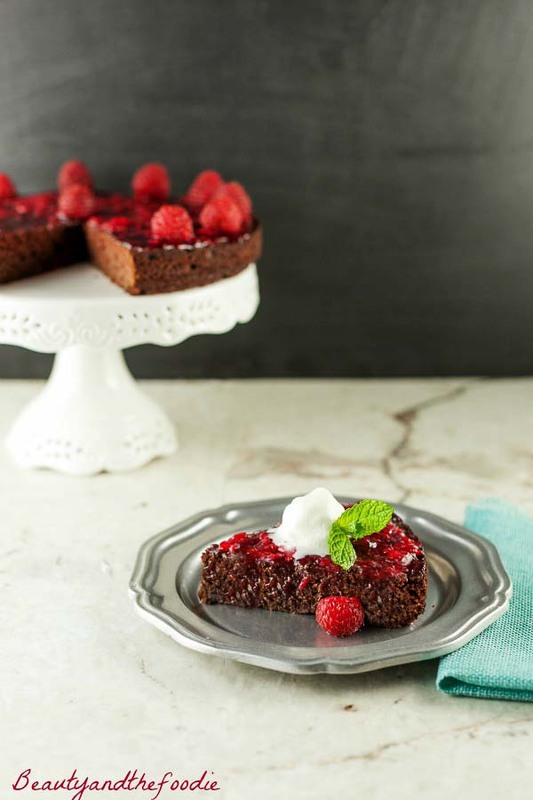 A lovely, decadent, Chocolate Fudge Raspberry Sauce Cake that is grain free, paleo, low carb, and keto. A divine chocolate cake with a sweet berry sauce. Perfect for special celebrations, Valentine’s Day, or everyday chocolate emergencies! Yes, chocolate emergencies do exist, and can happen randomly at anytime of the day. I had to make this cake 3 times. The first time I had overcooked it, yes I burned it. The second time, my springform pan decided to have the spring give out just as I was taking it out of the oven. The bottom of the pan fell out, and the cake fell all over the oven door. I could not save it, and now my oven needs deep cleaning. The third time I listened carefully for the oven timer and used a newer pan, and it turned out amazing. A good thing too, as it had become a full on chocolate emergency at that point! Preheat oven to 350 F, and grease or oil a 9 to10 inch Springform pan or 9 inch pan. In a large mixing bowl combine: cocoa powder, coconut flour, sweetener of choice, baking powder, and sea salt. Mix together thoroughly. Set aside. In a small sauce pan over medium heat combine and melt: butter or coconut oil, and unsweetened baking chocolate. Melt and stir together. Once it is melted and mixed completely, remove from heat. Let cool a couple minutes. In a separate large mixing bowl combine: eggs, unsweetened apple sauce, and vanilla extract. Mix together thoroughly. Add egg mixture to coconut flour cocoa powder mixture. Stir together. Add melted butter or oil and chocolate mixture to the batter and stir together thoroughly. Pour or spoon into prepared pan. Spread batter evenly in pan. Bake for 25 to 30 minutes, or until toothpick comes out mostly clean (though it can be removed from oven a little underdone, just not over done). Cool completely, and refrigerate for a couple hours (refrigeration makes it more fudgy texture). While cake is cooling, you cake prepare the raspberry sauce. In a processor or blender, mix the berries and sweetener of choice until pureed. For a seedless sauce, you can press the puree through a mesh strainer into a bowl (I left the seeds in mine, as I don’t mind the seeds). Store sauce in a covered container in the fridge. Spread sauce over each cake slice right before serving. *the berry sauce keeps better stored separately. Store unused cake portions and sauce in the fridge. Nutritional Data for Low Carb Version (using Swerve sweetener): Yield: 8 servings, Serving Size: 1 slice out of 8, Cal: 210, Carbs: 7 g, Net Carbs: 3.5 g, Fiber: 3.5 g, Fat: 18 g, Protein: 5 g, Sugars: 2 g, Sodium: 180 mg.
Nutritional Data for Paleo Version (using coconut sugar): Yield: 8 servings, Serving Size: 1 slice out of 8, Cal: 299, Carbs: 31 g, Net Carbs: 27.5 g, Fiber: 3.5 g, fat: 18 g, Protein: 5 g, Sugars: 26 g, Sodium: 180 mg.
A chocolate fudge cake with sweet berry sauce that is grain free, paleo and low carb. This looks delicious, I’m definitely going to have to try making this! You know what they say, third times a charm! I’m really glad you didnt give up on this cake recipe, because it is amazing! 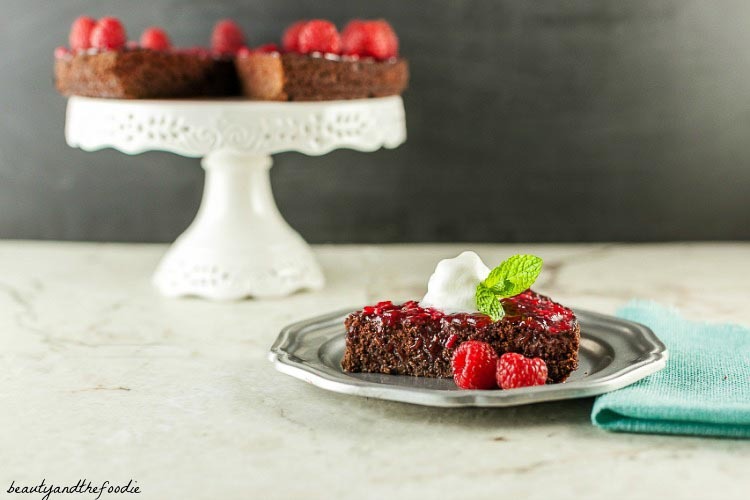 chocolate and raspberry is an incredible combo, especially in cake form!